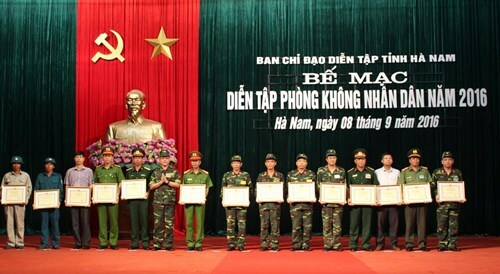 As a focal province in term of air defense and on the basic of fully awaring and thoroughly grasping the Party’s defense and military guidelines, especially the Central Resolution 8 (XI tenure) on “Strategy to protect the Homeland in the new situation”, over the past years, the Provincial Party Committee, People’s Council, People’s Committee of Ha Nam province have regularly attached importance to strengthening people’s air defense in the province, thus it has gained significant results. The notable feature in the implementation of people’s air defense in the province is the leadership all levels. It has been conducted by resolutions and concretized into plans of each sectors, namely: economy, defense, security, etc. After each term and each year, the steering committees are consolidated to ensure the right and appropriate structure and quality of staff to give advice on people’s air defense. Annually, basing on the real situation, the provincial government reviews, adjusts and supplements its plan for people’s air defense at all three levels to meet the target, requirements, missions and situation. It also directed its departments and sectors to planning for air defense, implementing those plans to be ready for wartime. During the implementation, the province requires that it is compulsory to adhere to the regulations and instructions of the Central Steering Committee for Air Defense, directly the Military Region 3 and the Air Defense – Air Force Service. The province also directs its local military agencies to coordinate with other agencies and department at their level to planning the program to organize the self defense and militia in general and the air self - defense and militia in particular in focal directions and areas; hold training classes in air defense for key cadres of departments and localities. In order to sucessfully implement the task of people’s air defense, the province has led and directed its departments, agencies, districts and military units to diseminate and train on the people’s air defence, focusing on the basic contents of the Decree 65/2002/NĐ-CP dated 01 July 2002 and the Decree 74/2015/NĐ-CP dated 09 September 2015 of the Government on people’s air defense; the tradition to defeat the destructive war of the US imperialists in the North during 1964 and 1972 period with the participation of the provincial armed forces contributing to “Ha Noi – the air Dien Bien Phu” victory in the last days of 1972, etc. It can be said that, in 2016, the task of diseminating and training on people’s air defense of the province has recorded new developments, making positive changes in the awareness and action of cadres, party members and people in the province. For the past time, the province has directed its agencies and units to promulgate a number of documents directing and guiding the people’s air defense work, such as: the People’s air defense Directive of the Provincial people’s air defense steering Committee, instructions for implementing people’s air defense of the Provincial Military Command and provincial departments. These are the legal foundation for levels, sectors, units, localities and people to carry out people’s air defense in accordance with their functions and missions. In socio-economic development plans, the province attaches importance to leading and directing the establishment of posture for defensive areas in general and posture for people’s air defense in particular. The provincial party committee holds that socio-economic and political development must be associated with defense and security. Therefore, in the process of building industrial zones, it directs to place the state owned enterprises adjacent to foreign enterprises to limit the possibility of being attacked by air strikes of the enemy in case of a war and ensuring the ability to manoeuvre, observe and fire air defense weapons provided to the provincial armed forces. With the direction of the province, military agencies at all level build their own plans for coordinating with other agencies and units to review and consolidate their staff and improve the quality of the reserve force and the air self defense force; directing the air defense steering board and military agencies to continue building the air self defense force in accordance with the Instruction 18/HD-BTM dated 04 January 2011 of the General Staff on the people’s air defense. It also focuses on consolidating the overall quality of air defense for self defense and militia units; giving priority on recruiting eligible personnel for the air defense force; increasing the number of party members in key positions. In order to strengthen the people’s air defense, on 26 July 2016, the Provincial People’s Committee issued the Decision 1123/QD-UBND on Project for the operation of the militia and self defense force for the 2016 – 2021 period. Thereby, favorable conditions are made for the organization, training, exercising of people’s air defense and for building the strong provincial defensive area meeting the requirements and mission of protecting the province and contributing to the cause of Homeland protection in the new situation.